Frank Lloyd Wright designed the Bachman Wilson house in 1954 for a site in Millstone, New Jersey. After changing ownership several times, and, in part due to repeated flood damage, the house was sold, disassembled and moved to Bentonville, Arkansas, where it is being reassembled as part of the collection at the Crystal Bridges Museum of American Art. A fifth-year option studio, led by Gregory Herman, associate professor of architecture, currently is preparing interpretive and documentary materials for the house. 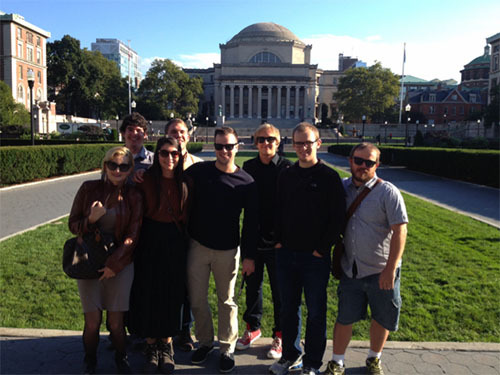 As part of our objective to learn more about Wright and the Bachman Wilson house, we went on a field trip to Columbia University’s Avery Library Archive in New York City, where Wright’s papers are held. The Avery Library is an architecture and fine arts library located at Columbia University. It is one of 25 libraries at the university. It consists of drawings and architectural records by American architects of the 19th and 20th centuries, including the Frank Lloyd Wright Archive (in partnership with the Museum of Modern Art). 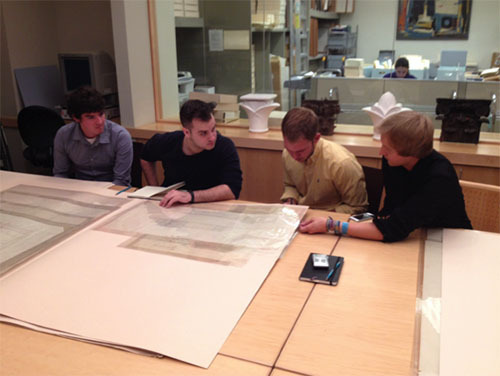 Architecture students conduct research in the papers of Frank Lloyd Wright, which are housed in the Avery Library Archive at Columbia University in New York. 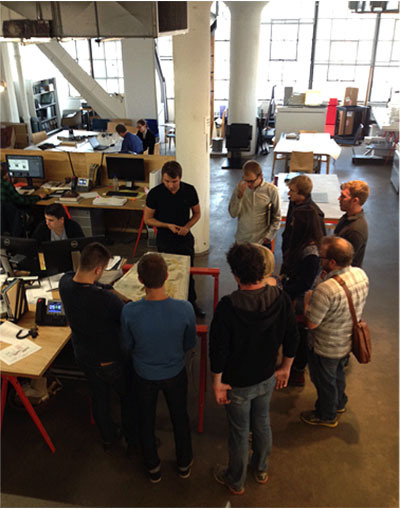 On Sept. 18 and 19, we divided into two groups and conducted a full work day at the Archive. While there, we studied the First Jacobs House, the Pope Leighey House, the Zimmerman House, the Palmer House and, of course, the Bachman Wilson House. We were able to see the original Bachman Wilson drawings, and document them, to further our understanding of the house. This opportunity allowed us to see different iterations of Wright’s houses as their designs developed, how they related to the evolution of Wright and his designs for Usonian houses. Through examining other Usonian house designs, and, for instance, learning how Wright began incorporating an organizational grid into his designs, being in the Archive was especially helpful as it allowed us to gain a fuller understanding of the design process used at the Bachman Wilson House. We observed several patterns and changes in Wright’s drawings that were useful in determining which houses we were going to further study. Seeing Wright’s original work up close definitely helped us connect with our project and has helped immensely with comprehending his thought process when designing the Bachman Wilson House. The Avery Archive truly was an indispensable aid in our research. Architecture students take a tour of Diller Scofidio + Renfro, a firm located on West 26th Street (in the Meatpacking District) in New York. While in New York, we also visited Diller Scofidio + Renfro’s firm. We were given a tour of the office, located on West 26th Street (in the Meatpacking District), as well as given an inside look at the projects currently being produced. At the firm, we also visited the fabrication studio where they create their models for projects and competitions. The New York trip proved to be a valuable learning experience. From dining with our professor to researching Frank Lloyd Wright, each moment of our trip was wonderful. We returned to Fayetteville on Sept. 21 and, with our minds and sketchbooks full, were equipped to continue the rest of our semester with confidence and newfound knowledge.